As Major League Baseball’s season kicks off, teams and fans around the country have high hopes. Those hopes include strong performances and healthy seasons for baseball’s best players. Rather than simply hoping for good results, more teams are beginning to embrace the role sports science and biomechanics can play in keeping athletes both effective and injury-free. The interest in sports science is practical: Every year, players are sidelined by injury. 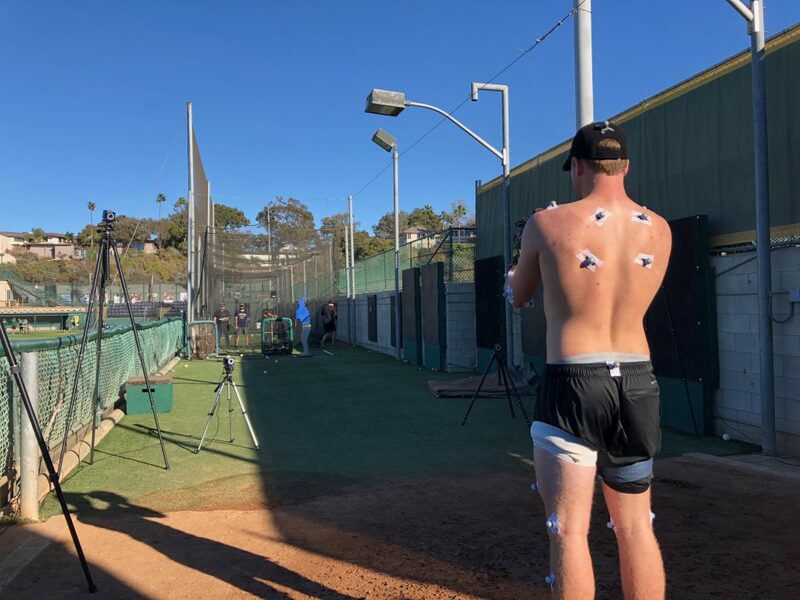 Arnel Aguinaldo, Ph.D., ATC, a professor in both PLNU’s undergraduate and graduate kinesiology programs, has been researching how to minimize the risk of the most common injuries among baseball athletes: injuries to the shoulder and elbow. Those at greatest risk are pitchers. From professional athletes hoping to avoid the dreaded, season-ending “Tommy John” elbow surgery to Little Leaguers just starting out, players at all levels can benefit from understanding the causes and possible solutions to elbow and shoulder injuries in baseball. Aguinaldo’s research subjects include both professional pitchers and college athletes from PLNU’s baseball team. His work is done with PLNU M.S. in kinesiology students at his side. Aguinaldo and his students use motion capture, or “mo-cap,” technology to quantify human movement. PLNU has 16 specialized cameras for the job. “We use ‘mo-cap’ to quantify the geometry of motion and the kinetics, which are the forces and torques associated with throwing,” Aguinaldo explained. What he’s found thus far is that some patterns of motion lower the risk of injury by lowering the load on the elbow during pitching. Increased valgus torque is a risk factor for an injury to the ulnar collateral ligament (UCL) in the elbow and an eventual Tommy John surgery to repair it. Aguinaldo has found that torque can be minimized by controlling the motion that happens prior to a pitcher’s throwing arm motion – that is, by controlling the motion that originates in the legs, pelvis, and trunk before the actual throw is made. Aguinaldo’s findings have been presented internationally at several major conferences, including the American Society of Biomechanics meeting in Rochester, Minn., in August 2018 and the World Congress of Biomechanics meeting in Dublin, Ireland, in July 2018. He also recently published an article, “Segmental Power Analysis of Sequential Body Motion and Elbow Valgus Loading During Baseball Pitching: Comparison Between Professional and High School Baseball Players,” in the Orthopaedic Journal of Sports Medicine. Part of the reason Aguinaldo’s research is receiving attention is because, he says, using mechanical energy flow to do energy and power analysis is a newer method for baseball. Recent advances in technology have made what he is doing possible. 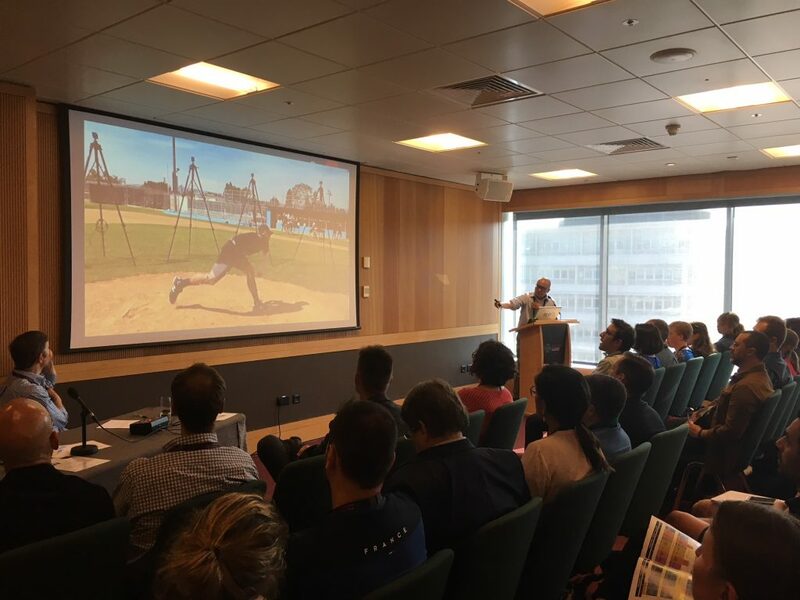 Dr. Aguinaldo presents his research at the World Congress of Biomechanics. Being at the forefront of this kind of technology-based research is a significant asset for students in the M.S. in kinesiology program. Due at least in part to their research together, one of Aguinaldo’s former students, Eric Burger (B.S. 17, M.S. 18), recently landed a sports science internship with the Tampa Bay Rays. Burger will be working with the major league team for spring training and then spend the rest of the baseball season working with the Rays minor league pitchers. The Rays internship came after Burger accompanied Aguinaldo to Major League Baseball’s Winter Meetings in Las Vegas. That’s where he interviewed for the internship. Burger’s work with Aguinaldo and his prior biomechanics internship at the Cedar-Sinai Kerlan-Jobe Institute, which he began for credit before he finished his master’s and continued with after, helped land him the opportunity. “I wouldn’t have been able to do anything without Arnel,” he said. 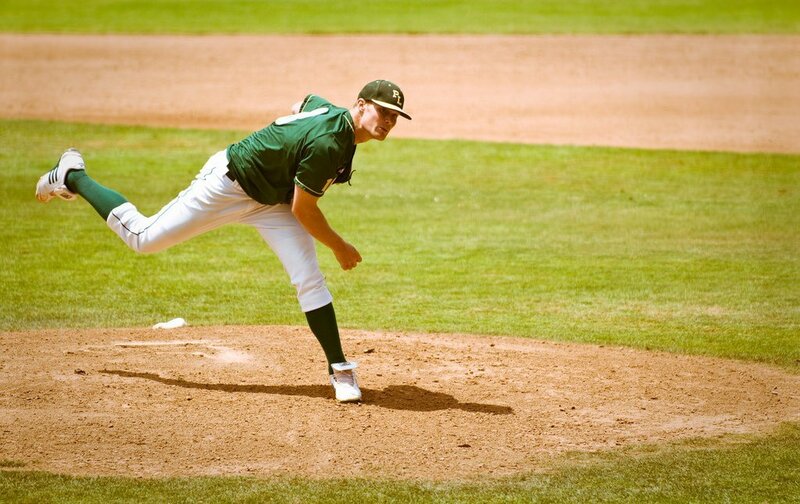 Related Article: Ryan Garcia’s (17) journey of playing baseball and finding God at PLNU. One of Aguinaldo’s current master’s students, Gretchen Hoffmann (15), is working with him on the next stage in their research for her thesis project. Based on what they have found so far about valgus elbow load, they are now investigating whether a balance intervention program can produce useful changes in pitching biomechanics. PLNU’s Susan Ganz, Ph.D., ATC, professor of kinesiology, designed the balance program. Biomechanic markers are placed on a pitcher to capture movements for later study. For Hoffmann, who also earned her undergraduate degree at PLNU, hands-on research experience was a draw to come back and earn her master’s. She also appreciates working with experienced faculty like Aguinaldo and having opportunities to network and meet people in the field. “The faculty-student relationship is really great at this university,” said Hoffmann, who hopes to work in biomechanics, ideally in baseball, when she graduates. Aguinaldo has taught at PLNU since 2013 when he started as an adjunct. He previously worked at SDSU as an adjunct professor and ran the motion analysis laboratory at Rady Children’s Hospital. In addition to pitching, he has used biomechanics to do walking and running gait analyses and to help patients with cerebral palsy. His doctorate is in health and human performance. As Aguinaldo and his students continue their work, they know it has the potential to benefit not only their own careers but also the professional and personal careers of baseball athletes everywhere. Are you Ready to Advance Your Kinesiology Career? Earn your Master of Science in Kinesiology (MS-KIN) through PLNU’s accelerated program in just one year. Speak with one of our admissions counselors at (619) 329-6799 or gradinfo@pointloma.edu today. We would love to help you determine your next steps.